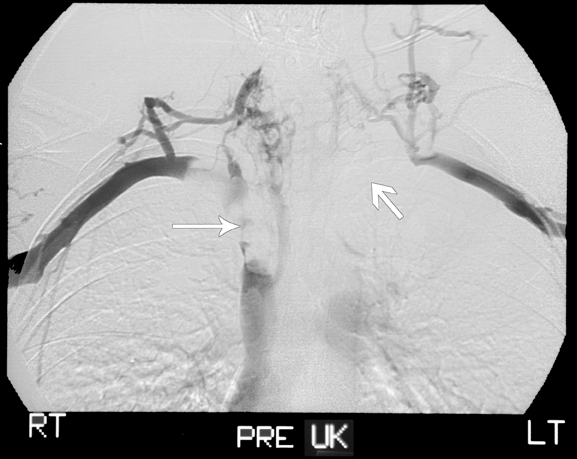 Venograms of the upper extremities demonstrated filling defects of the brachiocephalic and the subclavian veins bilaterally and theSVC proximally. There was collateralization of vessels with reconstitution of the azygous vein and opacification of the distal SVC (Figure 1). 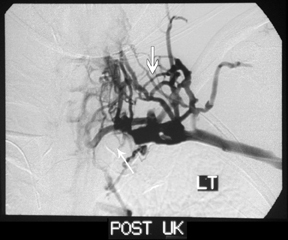 In light of these findings and the patient’s presenting history and physical exam, the patient underwent catheter-directed thrombolysis with urokinase (UK) and concomitant heparin therapy. Follow-up venograms of both upper extremities at 24 hours demonstrated no significant change in the pattern and extent of the filling defects when compared with the previous study (Figure 1). These findings mandated higher consideration for a primary or metastatic intravascular malignancy. Magnetic resonance imaging (MRI) of the chest performed with and without gadolinium revealed a mass involving the SVC and bilateral brachiocephalic veins along with expansion of the involved vessels. 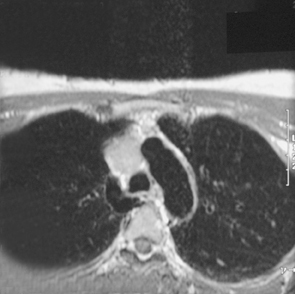 The bulk of the lesion, measuring 4.0 × 3.0 × 4.5 cm, was located within the SVC. The lesion demonstrated intermediate signal intensity on T1-weighted images (Figure 2) and high signal intensity on T2-weighted images (Figure 2). 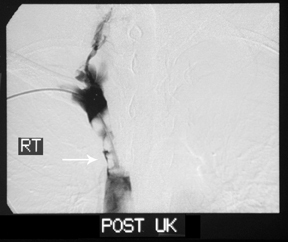 Moderate enhancement of the lesion was also demonstrated postcontrast administration (Figure2). There was no lymphadenopathy. These findings were most consistent with a neoplastic process involving mediastinal venous structures. The patient was surgically explored and the identified tumor was resected. The SVCS is typically associated with malignancies such as lung cancer and lymphoma, which result in extrinsic compression of the SVC. Benign causes including intraluminal thrombosis, fibrosis, and infection also exist. Our patient’s history of present illness was not suggestive of malignancy. There was no lymphadenopathy, no gross pathology of other visceral organs, and no constitutional symptoms to suggest primary cancer or metastases. Furthermore, primary malignant disease of a large vessel, such as the SVC, is an extraordinarily rare phenomenon. 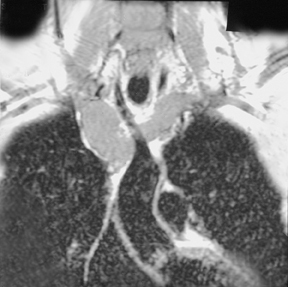 With these considerations and the initial venogram findings in mind, priority was given to the possibility of vascularthrombosis over malignancy. Our case demonstrates the serendipitous role of thrombolytic therapy in diagnosing nonthrombotic vascular pathology. Noteworthy is the role that imaging, along with a basic understanding of the physiological processes and the pharmacologic agents involved invascular thrombolysis, played in the timely diagnosis and subsequent treatment and remission of this rare malignancy. ALCL is a rare neoplasm. To our knowledge, this is the first imaging description of ALCL involving a large vessel. 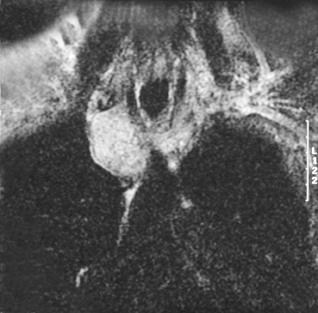 Although the imaging findings are not specific, this case of ALCL serves as a reference for consideration of other diagnoses in the differential of large-vessel occlusive disease. 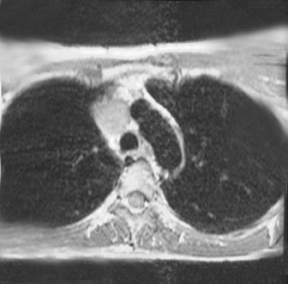 While unusual in its incidence, this entity has strong relevance to the radiologist. Patients with SVCS will benefit from our specialty having an attentive and current awareness of the disease pathogenesis, since the radiologist is in the unique position of being able to identify etiology early in the course of disease, allowing for prompt treatment that may alter prognosis. Pfleger L, Tappeiner J. Zur kenntnis der systemisierten endotheliomatose der cutanen blutgefasse (reticulo-endotheliose) [On the recognition of systematized endotheliomatosis of the cutaneous blood vessels (reticuloenothrliosis)]. [Article in German] Hautarzt. 1959;10:359–363. Molina A, Lombard C, Donlon T, et al. Immunohistochemical and cytogenetic studies indicate that malignant angioendotheliomatosis is a primary intravascular (angiotropic) lymphoma. Cancer. 1990;66:474–479. Wick MR, Mills SE, Scheithauer BW, et al. Reassessment of malignant “angioendotheliomatosis.” Evidence in favor of its reclassification as “intravascular lymphomatosis.” Am J Surg Pathol. 1986;10:112–123. Setoyama M, Mizoguchi S, Orikawa T, Tashiro M. A case of intravascular malignant lymphomatosis (angiotropic large cell lymphoma) presenting memory T cell phenotype and its expression of adhesion molecules. J Dermatol. 1992;19:263–269. López-Gil F, Roura M, Umbert I, Umert P. Malignant proliferative angioendotheliomatosis or angiotropic lymphoma associated with a soft-tissue lymphoma. J Am Acad Dermatol. 1992;26:101–104. Snowden JA, Angel CA, Winfield DA, et al. Angiotropic lymphoma: Report of a case with histiocytic features. J Clin Pathol. 1997;50:67–70. Sheibani K, Battifora H, Winberg CD, et al. Further evidence that “malignant angioendotheliomatosis” is an angiotropic large cell lymphoma. N Eng J Med. 1986;314:943–948. Williams DB, Lyons MK, Yanagihara T, et al. Cerebral angiotropic large cell lymphoma (neoplastic angioendotheliosis): Therapeutic considerations. J Neurol Sci. 1991;103:16–21. Angiotropic large cell lymphoma of the superior vena cava. Appl Radiol.